In the fourth post celebrating 52 years of Nigerian Literature, I am taking a look at literature from Northern Nigeria. While authors like Zaynab Alkali, Abubakar Gimba and Labo Yari made up the second generation writers, I am looking instead at Hausa Popular Literature, which is also known as Kano Market Literature (as most are written and sold in Kano, the second largest city in Nigeria and the heart of Northern Nigeria), and in Hausa as littattafan soyayya (books of love/romance literature). 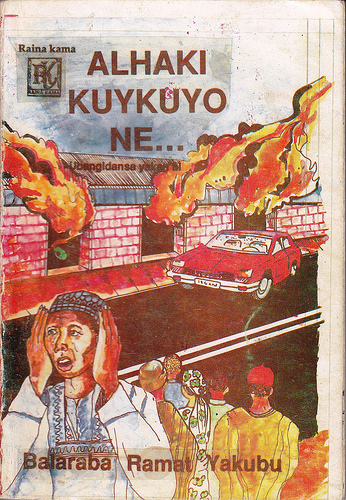 These novels, which are romantic pulp fiction written in Hausa, began in the 1980s and while they have faced some criticism for not being serious literature and for morally corrupting young girls, they are pretty feminist. Soyayya novels are mainly written by women and explore themes of love and marriage, as well as other issues which are relevant to women and girls in the contemporary Northern Nigerian society - polygamy, forced marriages, purdah (seclusion), and female education. If you want to know more this article on contemporary Hausa literature gives some insight into it, there's an interview here with a Soyayya author, the blog A Tunanina also has information on Hausa literature (and film), and SOAS has a pretty extensive Hausa Popular Literature Database. 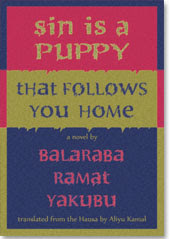 Recently, Indian publisher, Blaft, published an English tranlation of Hajiya Balaraba Ramat Yakubu's 1990 novel Alhaki Kukuyo Ne (Sin is a Puppy). Balaraba Ramat Yakubu is one of the earliest, and most popular, Soyayya writers and you can find out more about her here. And if you are the slightest bit curious about reading Hausa Popular Literature, there is a link to an excerpt of Sin is a Puppy on Blaft's blog here. i am you post this cuz iam definitly inte in discover more Hasua lit. i am yorbua and the Virtous woman was the book that intro in Nigeria to good books written by us nigerians, though i am yorba i want find out more about my northan family.